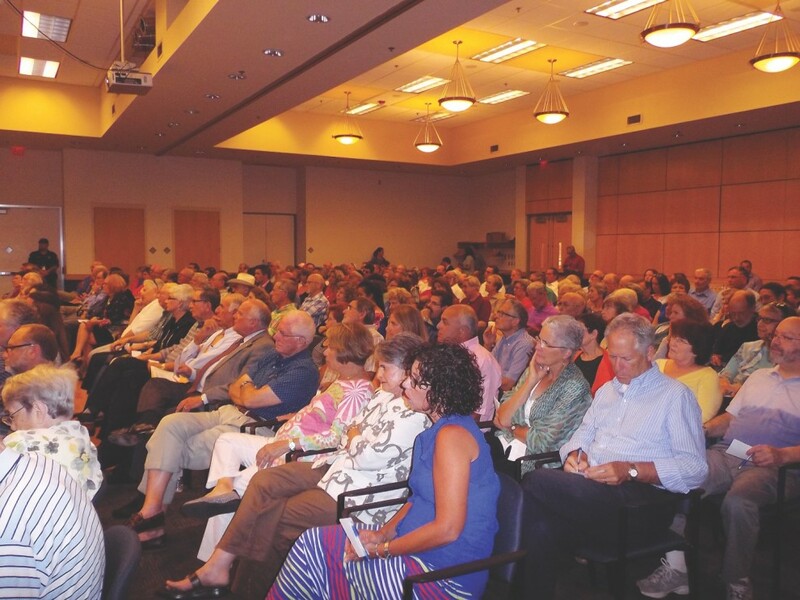 The Jewish Community Federation of Richmond on Aug. 25 held a special JCRC Community Forum on the Iran Deal. The forum featured two senior policy experts who educated and informed the community about the Joint Comprehensive Plan of Action, also known as the Iran Deal. The speakers addressed more than 225 community members via a live video conference during the approximate 90-minute program. Acting Under Secretary for Terrorism and Financial Intelligence Adam Szubin from the U.S. Treasury Department spoke on behalf of President Barack Obama’s administration. The under secretary was involved in the talks that led to the JCPOA. Steven Beckerman, deputy directory of Policy and Government Affairs at American Israel Public Affairs Committee, spoke against the JCPOA. Beckerman has worked at AIPAC since 2004 and oversees AIPAC’s team of Middle East policy analysts. Samet explained the announced speaker from AIPAC, Ambassador Brad Gordon, was not able to address the community, and Beckerman, his deputy, had stepped in that afternoon. Samet thanked Elliot Mendes, AIPAC’s Southeast regional director, for also attending the forum and continuing the discussion with community members after the forum. He explained, prior to 2005, the U.S. had worked for a long period to “devise a strategy to increase pressure on Iran to curtail its nuclear program.” This included putting sanctions in place but they had little effect on Iran reducing its nuclear program. As a result, talks moved ahead by the U. S. and its partners in the UN Security Council, plus Germany, and an interim deal was reached with Iran in 2013. Beckerman also said the snapback provisions in the deal will not work. “Minor violations will not result in snapbacks ... and they expire in 10 years.” This comment refuted an earlier statement by Szubin who noted sanctions could be stepped back quickly and proportionality to more minor violations by Iran. In response to questions, he said recent polls in the U. S. showed greater opposition to the deal in swing states. He also pointed out a substantial number of former military leaders in the U. S. are expected shortly to come out publicly to oppose it. Beckerman said many former military leaders and others who support the deal often point out objections to certain aspects of it. He called for the Congress to oppose the deal and suggested new sanctions could be imposed against Iran if Congress rejected the deal. In response to a question, he said Europe’s sanctions on Iran have posed a greater deterrent to the country than some from China and Russia, and if our allies there would support the U. S., new sanctions could have an impact. However, he emphasized Iran’s support of global terror has continued and will not end with this deal. Community members applauded each speaker and were respectful in the packed Israel November auditorium with many standing during the forum. During the program, community members filled out a total of 60 note cards with questions. Each speaker had time to answer roughly 5 questions. Frances Goldman, JCRC chair, concluded the forum. “Undeniably, the weeks since the president’s announcement in July have been challenging for our Jewish community in Richmond and for the national Jewish community. Both of our presenters spoke compellingly about how their cause was for the safety of the United States, the State of Israel, and indeed the world. Many times, Federations unite forming one voice of the organized Jewish community across America. For better or worse, this is not one of those times,” she said. “The Jewish Community Relations Committee has multiple roles in these situations. I would sum them up in four words, borrowing from Yehuda Kurtzer, president of the Shalom Hartman Institute of North America, and they are: convening, educating, organizing, and leading. Tonight, we have accomplished all of these goals. “By making the Federation and JCRC the Richmond community’s space for this deliberation, we are working toward gathering our entire community for civil discourse on the salient issues crucial to our continued existence as a Jewish Community. We welcome the various Synagogues, agencies, and individuals and thank the Rabbis and lay leaders for recognizing the value in joining together for this forum. As Richard said, we are enormously proud of tonight’s event. Educating our community is at the heart of what we do and regardless of any one person’s beliefs on the JCPOA, our experts tonight provided an excellent education. “Kurtzer’s last two points, ‘Organizing our Community’ and ‘Leading it successfully,’ point to the question that faces every Jewish Federation these days, now what? This is not a simple question. Many, many factors weigh in on the Federation’s lay and professional leadership. “Allow me to share just two for example -- What does Federation and JCRC policy state about making statements regarding policy issues? The long standing policy of the Federation and its JCRC has been to make statements regarding policy only in areas of consensus. When contentious issues arose in the past (and this is hardly the first contentious issue to arise) the Federation and its JCRC did not issue a statement. The leadership led toward consensus, understanding that even as passions (and a few tempers) rose, the risk of alienating and splitting our community was not worth the potential gain of any given statement. “What happens if the JCFR issues a statement? Where is our political clout next time? To paraphrase Mr. Kurtzer, leadership used well can result in inspiring, motiving and achieving transformative outcomes while maintaining – if not strengthening – a community through change. She thanked the community members, the guest speakers Adam Szubin and Steven Beckerman, and Elliott Mendes from AIPAC for his attended. For more information, contact JCRC Director Doni Fogel at DFogel@JewishRichmond.org.